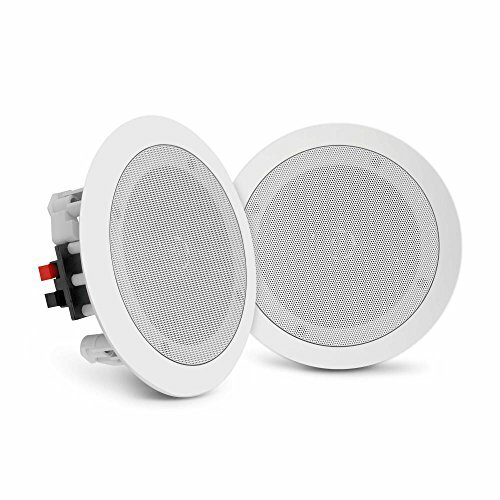 The Pyle In-Wall/Ceiling Speakers deliver stereo sound to any room in your home or office. Each speaker comes equipped with a high compliance polymer tweeter delivering a full, rich sound without cluttering floor space. Speakers are made of ABS material and include changeable round and square grills. The system features spring-loaded speaker terminals for quick connection and comes with a cut-out template for easy installation. Mount them in a convenient location on the wall or ceiling for a flush, clean look. Achieve wide-range sound performance and add audio to any room with the Pyle In-Wall/Ceiling Speakers. Single Speaker Weight: 9.03 lbs.